Samsung is prepared to unveil its upcoming smartphone Samsung Galaxy S8 on March 29, at Samsung Galaxy’s Unpacked 2017 event. There have been huge buzzes about the company to refresh the design of the Galaxy S8 series. The touting feature which is likely to be shown in the new range of its superior smartphones is virtual assistant Bixby, which has to be confirmed by the company yet. The feature has been known via leaks. The image has been posted by Evan Blass (an expert), which shows another picture of Samsung Galaxy S8. He tweeted “I think this is what you’ve been waiting for”. Along with this line his tweet consist an image of a dedicated physical button at the left side. This button is exclusive to Samsung’s new smartphones which is said to be adding the dedicated button for Bixby. To witness how it actually looks and feels, we have to wait till its official March, which is expected to be on March 29. Samsung’s new AI assistant which will work with native apps too. Another leaked image of the smartphone shows long and narrow display on the Samsung Galaxy S8. The current industry standard of the display ratio is 16:9, but Samsung is going beyond that and will launch a new one which will be 18:9. It was heard that Samsung is planning to eliminate its physical home button at the front, and with the pictures leaked, we can observe the same. You might find the iris scanner above the display besides the front-facing camera. It also shows that the smartphone will have a new look with near bezel-less display. Talking about the specifications, Samsung Galaxy S8 is expected to be packed with latest Qualcomm Snapdragon 835 SoC with 4GB or 6GB of RAM. It will be made up of 64GB inbuilt storage, which can be expanded upto 128 GB via microSD card. It will be backed by 3250mAh battery. 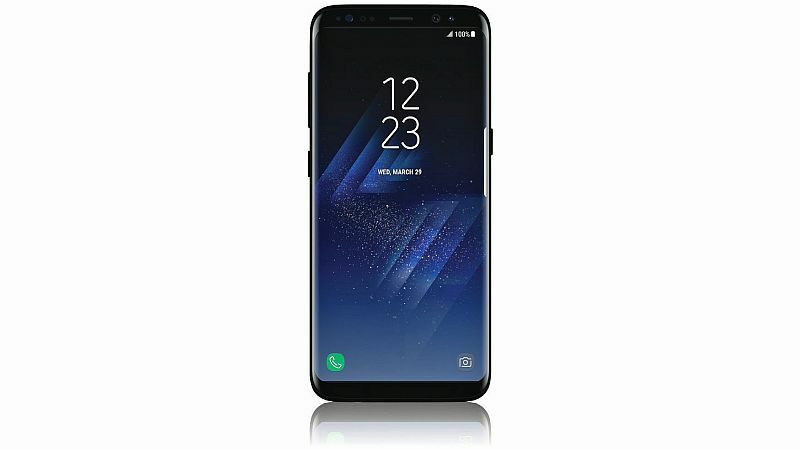 The cost of Samsung Galaxy S8 will be around EUR 100 (approximately Rs 7300) and is likely to witness a sale on April 21. NextAre You Ready To Try Your Hands On Blackberry KeyOne?